This is the scene most workday mornings on Rt. 1, just north of here. Multiply this by hundreds of roads and you have rush hour in the Washington DC metro area. It has been reported that the-powers-that-be-in-power at this very moment expect to move 18,000 defense department jobs out of Crystal City, VA south to Fort Belvoir within the next three years. These new places of employment are located...you guessed it...along the route pictured above. Sounds like a plan of total gridlock to me. 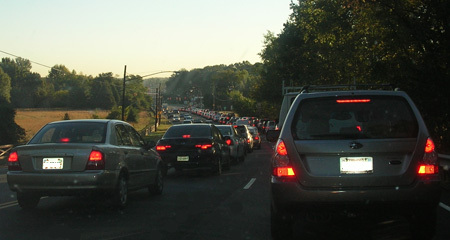 The average commute for some folks in the DC area is three hours every work day. 15 hours a week. Cheez, the commute's a part-time job, isn't it? How many people commit these precious hours of their lives each week to work at jobs they may not like? Plus the time it takes to get ready, get there, then get home again? It's scary to compute your hourly wage. In the book Your Money or Your Life, authors Joe Dominguez and Vicki Robin ask "Does making a living feel more like making a dying?" What is the real cost of simply maintaining your job? And is it really worth it? Let's say, after taxes, you make $20 an hour working in an office in downtown DC. That's $160 bucks a day. $800 a week. $3200 a month. $38,400 annual take-home pay. BUT: add the "getting ready" time, plus the commute. On a good day - 1 hour to get ready, 1.5 hours to drive to the office, work 8 hours, then commute 1.5 hours home. So, not counting an hour off for lunch, you are really devoting 12 hours a day to the job. So 160 divided by 12 = 13.33 You are really making $13.33 an hour. That's not even counting the cost of your work clothes, parking, gas, wear and tear on your car, dry cleaning, childcare, eating lunch out a couple of times a week, and those sodas and snacks from the office vending machine. And the sheer exhaustion and frustration of sitting in traffic. In these days of broadband Internet connections, many of the folks I meet in class tell me they are not "allowed" to work from home. They are "required" to be in the office. These men and women are programmers, fergawdsakes, and are some of the hardest working people I have ever met. I can sense the frustration in their lives. They need these jobs, not just for the money, but for the health benefits for themselves and their families. It's not only the commute that's horrible. It's the wasted life energy that will some day take its toll. "Mozart starved, but you allow Thalberg and Liszt to make tons of gold: of course, you may think that someone immortal cannot die of hunger." OK...I just finished my commute from Iowa City to Cedar Rapids and then read this. I was lamenting, as I walked from my car to the office, about the time I spend on the road every day. Then I saw this photo. And I remembered that, at the very least, my car moves at highway speeds all the way from my house to my office and back. I might be commuting, but I'm not sitting in traffic. Ugh. That traffic is SO not worth it.